Steve Niles and Alison Sampson have arrived to disrupt your bedtime. What happens when an American family traveling on vacation finds themselves stranded in a small town with a sinister secret? The answer is a whole lot of creepy. Niles wastes no time in setting the tone of this limited horror series 'Winnebago Graveyard.' A couple is abducted by people in hooded robes and are sacrificed during some kind of satanic ceremony that gives birth to something I can't explain here. You'll have to see it for yourselves. Then we're introduced to our protagonists, the dysfunctional family traveling via the titular Winnebago. They make the same mistake every person in a horror does, they stay at the creepiest locations instead of turning right around at the first sign of danger. But that's what makes horror so much fun, seeing people in jeopardy and sometimes getting what they deserve. So the gore and tension start off the issue and an underlying unease will unnerve you the rest of the way. Of course the family pulls off the road looking for something they can do together and visit an old weird carnival (Drive away, people!). It's empty, there's no crowds, no long lines, just this family making a day of it among the carnies. What could go wrong? Just enough to keep them in town. Now, stranded, on foot, and alone, the family has to seek help from someone but where are all the townies? Niles is economical with the dialogue and exposition. He lets Sampson and colorist Stephane Paitreau tell most of the story with almost surrealist images that capture the frenzy of the opening scene and the near quite emptiness of the carnival. Sampson fills the pages with larger than usual panels providing more scope of each scene sometimes making the family members look small to emphasize their desolation. Paitreau's colors change the mood of the story as it goes from day to night. The dry earth tones of the day give way to purples and blues of the night. It's almost like the night has come alive by comparison to the bright deserted landscapes of the day. The book takes on the veneer of a 1970's cult horror film from Sampson's character designs of the family and especially of the carnies. You can't help but be unsettled at what may or may not happen next. 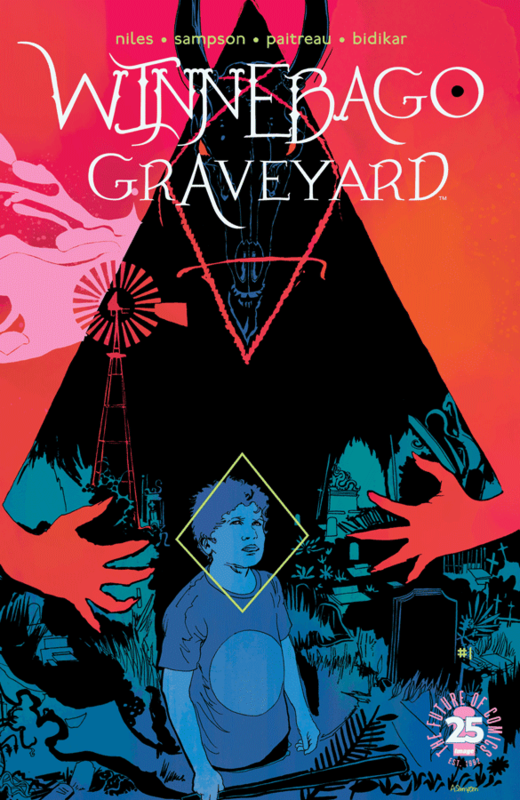 'Winnebago Graveyard' is an unapologetic horror throwback that has one goal in mind: to freak you the hell out. Niles and Sampson make it work by shocking you at first and keeping you on edge from that point on. It's an atmospheric mind-f*ck that will raise the hairs on the back of your neck. This is just the beginning, expect a wild ride into some terrifying territory.